HARMONIK PICVIDEO SPOTLIGHT ON NEW SONG "I HEART U" OFF NEW CD (WATCH & LISTEN)! 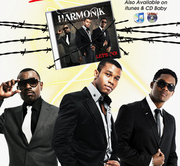 Here is a PICVIDEO spotlight of HARMONIK song "I HEART U" from their just released new cd on the market. (WATCH & LISTEN)!